Well, I was on here Wednesday...and next thing I know...it's already Saturday! 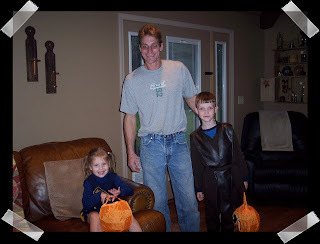 I hope every one had a FUN Halloween! My sil stopped by with her kids...our niece was a cute little cheerleader and our nephew, well I'm not sure what he was....LOL! Steve say's he was a ninja!? 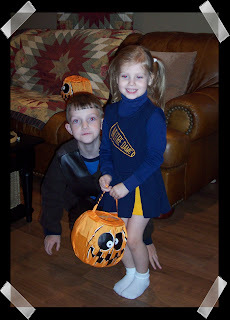 Elizabeth & Andrew were the ONLY trick-or-treaters we had! We live out in the boonies....so we never have any kids stop. That's fine with me....I had my share when Brad was younger! :) I don't really miss it. I tell ya--I've been workin my lil fingers to the bone, these past few days! I did get my frig cleaned out...I didn't have much to throw out. I finished my 'God Bless Ewe' stitchery too...I got the free pattern from Twigs. I can't wait to get it framed! I think we're just gonna try making some frames. So, when I wasn't stitchin'....I was sandin' and fillin' nail holes! Steve and I have been doin our wood workin' projects in the evenings.... haven't got them finished yet...I will be working on that this week. I have some other things started too, but I can't post them...as some are swap gifts! I think I will just stain the inside, rather than painting it?? I don't know yet. Sometimes I have NO PLAN...lol...I just do it as I go...and those projects usually turn out as the best ones! So-anyway, that's what I've been up to since last Wednesday! I have so much to do and so much I WANT to do...and I feel like Christmas is gaining ground so fassssssssssst! I start to get myself worked into a tizzy over it!!! Com'on over...have a look-see at what I got!! Finished my Side Table & a 100th Post give-away!! Ahhhhhh Election day is OVER!! !